President Trump called into "Fox & Friends" on Thursday morning for a lengthy 47-minute interview, discussing virtually every hot news topic of the moment. The bottom line: Trump's freewheeling interviews on the friendly turf of "Fox & Friends" seemingly allow him free rein to speak his mind. He told the hosts that only their program — not even Fox News as a whole — is exempt from the "dishonest media" label. "If he doesn't, then he gets overruled by me because I make the decision. He doesn't." "[W]e're being very tough and we have investigators over there, and we're working with Turkey, and frankly we're working with Saudi Arabia. ... He went in and it doesn't look like he came out. It certainly doesn't look like he's around." He said Rep. Devin Nunes, who has been a strong opponent to the Russia investigation, should get the Medal of Honor. "If this all turns out like everyone thinks it will, Devin Nunes should get the Medal of Honor. ... What he's gone through, and his bravery, he should get a very important medal — maybe we'll call it the Medal of Freedom." He's not worried about possible 2020 Democratic challengers, singling out Sens. Bernie Sanders, Cory Booker, and Elizabeth Warren for lengthy asides about their potential candidacies. "I like every one of them, I just hope they stay healthy and I hope they fight it out. ... I just hope we don't get any star or good-thinker coming out of nowhere. ... I don't want to be too harsh because I want them to be able to get through the process." "There is a chance — I don't say it's a big chance — but there is a very good chance that that was written by the Times. ... I wouldn't be that surprised because the Times is totally corrupt." 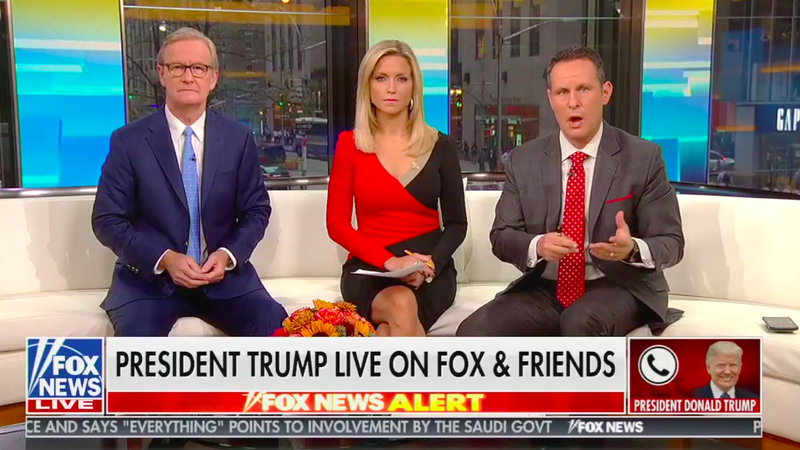 The highlights from Trump's similarly expansive April "Fox & Friends" chat. Trump's morning tweets perfectly align with "Fox & Friends."